It’s not difficult to imagine the jokes and raised eyebrows that must be going around when people learn from our schedule of events that the Sunday service on the morning of October 14 celebrating the 120th Anniversary Service of the Centre for Christian Studies will take place at the Thomson Funeral Home on Broadway Avenue opposite Young United Church. An Anniversary Service in a Funeral Home? What kind of message is that? The service takes place on a Sunday morning, and most church spaces are in use at that time! 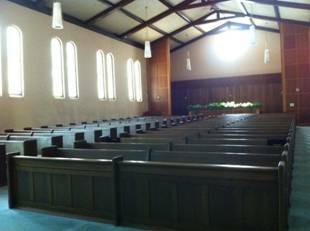 The Funeral Home is directly across the street from Young United Church, where most of our weekend events will take place, and just blocks away from Woodsworth House – so it offers a convenient and familiar location. Thomson Funeral Home offered to make their chapel and reception facilities available to us for no charge! We only have to provide the worship leaders and musician and pay for the caterer. You can’t beat that kind of generosity. When you think about it, funerals homes are places of hospitality that bring together family and friends from many generations to celebrate life, let go of the past, and look toward a new future. Isn’t that what we’re doing on our Anniversary Weekend? Funeral homes are also places of grieving. I hope that’s one thing that will differ between a funeral and our anniversary! Of course, everyone will have something or someone they miss, or want to let go of, or would rather not remember, about their association with this school – whether recently or long ago. But time, faith and friendships heal, especially in the context of community. Co-chair Jim Boyles and Central Council member Patty Evans (also a musician) have agreed to design the service, combining aspects of our joint Anglican and United Church traditions. Thank you! Let’s see our Celebratory Worship on Sunday as a time of hospitality that brings together family and friends from different generations, denominations, and histories. A time to celebrate faith and friendships that heal the past and look toward new possibilities in the joyful spiral of life!